Portsmouth, Ohio – Shawnee State Men’s Basketball pulled together an incredible final stretch to defeat Cumberland (Tenn.) 86-83 on Thursday evening. Shawnee State shot 56.8% from the field and 47.3% from beyond the arc. EJ Onu (SO/Cleveland, Ohio) was dynamic on both ends of the floor, finishing with 24 points and four blocks. Juwan Grant (SR/Baltimore, Maryland) showed out once again, this time completing a double-double with 19 points and 11 rebounds. The Bears and Phoenix both hit the ground running early in the first half as each squad would hit on their first two possessions. At the 16:55 mark, EJ Onu would splash two free throws to put the Bears on top 8-5. Cumberland would bounce back and tie it up several times, as both teams struggled for momentum; it was locked at 12 each with 13 minutes to play. At 12:49, SSU’s Juwan Grant made a power move into an and-one bucket after an offensive rebound. Grant made good on the three point play and added a score on the following possession as the Bears led 17-12. Late in the first half, SSU had built a 33-25 lead as they approached the last 5:00 of the first. Juwan Grant would make a double move to score in transition two possessions later that extended SSU’s lead to 10. Cumberland would crawl back to within five until a Gavin Brown (SO/Carroll, Ohio) catch-and-shoot three with two minutes remaining made it an eight point SSU lead once again. Shawnee would have the last possession of the first half which ended in an electrifying Austin Crawford (SO/Brooksville, Kentucky) corner three at the buzzer. Going into halftime it was a 44-35 Bears lead. Cumberland opened the second half with two straight scores, narrowing the deficit to five. The Bears bounced back on the next two possessions, including a monster one-handed dunk from EJ Onu. Shawnee would go on a 9-5 run to lead by 10 with 15:43, making the score 56-46. Cumberland continued to battle, this time putting themselves within two, it was 58-56 SSU lead with 13:04 left to play. With just under 12 minutes to play, Cumberland would take their first lead of the half going up 60-58. The Bears answered on the next possession with an Austin Crawford field goal. Niether team was able to pull away, going back and forth for the next five minutes. At 9:09 to play it was 64-62 SSU when Tamal Watkins (JR/Columbus, Ohio) drilled a three to extend the Bears lead to five. Cumberland took the lead at the 5:44 mark making it 71-70. 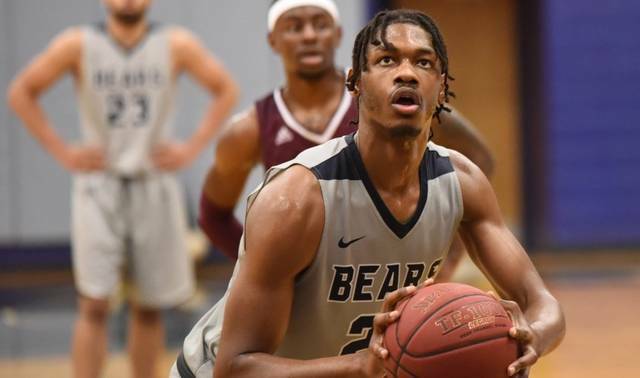 The last three minutes opened with Ej Onu making two crucial free throws to put the Bears within one of the Phoenix, with the score at 78-77. SSU trailed by as much as six before EJ Onu made good on an and-one attempt that made it 83-80 Cumberland with 1:57 to go. A block sparked an incredible sequence for the Bears with just over a minute to play. First, Gio Jackson (JR/Federal Way, Washington) would go out in transition and finish a layup in traffic, on the Cumberland inbound,Tamal Watkins would steal it and drive to draw a foul. After Watkins splashed both, the Bears led 84-83 with 1:04 to play. With 15 seconds remaining, Justin Johnson (JR/Cincinnati, Ohio) would drive and bank in a layup to push the Bears lead to three, giving Cumberland just 11 seconds. The Phoenix couldn’t hit the three to tie it up, Shawnee State won in dramatic fashion 86-83. Shawnee State Men’s Basketball return to the cave on Saturday, Feb. 9th against Lindsey Wilson. Tip-off for that matchup is scheduled for 4PM.